CLT Update: 08 Sep 24 - Yes on Question 1 -- or what? Yes on Question 1 -- or what? Members from the Committee on Small Government and the Massachusetts Taxpayers Association [sic-Foundation] squared off Thursday in Lexington over Ballot Question 1, the repeal of the state’s income tax. Kamel Jain, spokesperson for the Committee on Small Government, and Michael Widmer, the president of the Massachusetts Taxpayers Association, traded barbs and statistics, and answered questions about Ballot Question 1 from the audience at the Depot Building in Lexington Center. The event was the first session of the 14th season of Rep. Jay Kaufman’s (D-Lexington) “Open House,” a public cable forum on government policy. Kaufman served as moderator for the discussion, but stated early on that he was vehemently against Ballot Question 1. Although the statutory budget is $28.2 billion, that figure is only part of the overall budget. There are also nonbudgeted spending, capital spending, and expendable trust spending. Taken together, these four items add up to $47.3 billion. Ending the income tax would cut state spending by just 27 percent, leaving billions of dollars in state government waste still to cut - without even touching the waste in local government spending. An upcoming analysis by the Massachusetts Taxpayers Foundation shows that if one were to preserve the 2008 level of spending for Medicaid, health reform, state aid to municipalities, and debt service, then one would have to eliminate every other program of state government - from prisons, courts, and State Police to funding for higher education and the elaborate network of services for the elderly, disabled, and others in need. "But I only want to send a message," some voters might say. Find some other way. It's no exaggeration to say that your future, and the Commonwealth's future, are at stake. Investors and public finance officials in the $2.66 trillion municipal bond market have their eyes trained on a 30-square-mile former Navy town in northern California. Cities and towns across the U.S. are suffering as declining home sales and the slowest growing economy since 2001 erode tax revenue while labor and benefit costs rise. In California, the average amount that cities, counties and schools pay for pension benefits, as a percentage of their payroll, has more than doubled to 26 percent from 12.4 percent in 2001, according to the Public Employee Post Employment Benefits Commission. "Other cities are now saying they could just do a Vallejo," said Dean Gloster, a lawyer for the city's unions. A recent McDonnell survey of 350 local governments found the average amount of money needed to make future pension payments more than doubled over the past five years. Those cities spent $3.39 million in 2007 to meet their pension obligations, up from $1.23 million in 2003. Salary costs for the 75 most-populous U.S. cities rose 47 percent between 1995 and 2005, U.S. Census Bureau data shows. Detroit's annual public employee payroll surged to $143 million from $50 million during that decade. Los Angeles saw its payroll increase to $304 million from $191 million. A survey of government finance officers by the National League of Cities in Washington found that 64 percent of cities are less able to meet their fiscal needs now than in 2007. The battle is waging over Question One on the November 4th ballot. Both sides are trying their hardest to sway the undecided: Carla Howell of the Committee for Small Government, spokeswoman for the "Yes" side, and; Michael Widmer of the so-called Massachusetts Taxpayers Foundation and apparently designated spokesman for the "No" side of the ballot question, are having at it. Carla is representing taxpayers; Widmer is, as usual, representing business as usual on Beacon Hill. The massive army of public employee unions and private sector unions feeding off government contracts have unlimited financial resources, and brigades of trough-feeding members who'll go anywhere, do anything, to keep their gravy train running on its tracks at taxpayer expense. They are organizing cells in every community across the Commonwealth. The Big Government establishment and, I expect, most if not all the media, are or will be behind the unions' cause, promoting the tax-borrow-and-spend status quo. This won't change the outcome. Oh, it may affect the election results -- but it won't change the outcome. The real outcome is the spiraling cost of government at the local and state level. We now know the real cost of government at the federal level -- what it is and what it'll be very soon, after its bail-out of Big Business and fatter cats than even belong to Widmer's MTF cabal. As Bloomberg -- a business publication -- notes, the cost of government is skyrocketing. This is primarily due to public employee unions. This explains why so many millions from those unions are pouring into the "Coalition for Our Communities" -- the "No" on Question 1 ballot committee. This growth of government is unsustainable. It's a ticking time bomb sitting in our collective living room. That's a given. The question is, how much more will taxpayers pay before either they go bankrupt (with no government bail-out), or before they stand up and shout "Enough!" A "Yes" vote on Question 1 is that shout, and not as some symbolic "message," as Widmer put it. It's now or likely never. I've been following the Vallejo, California bankruptcy case for a while. A federal judge recently ruled that, if the city and its public employee unions can't reach a mutually agreeable settlement, then the city will be declared bankrupt and all contracts will become null and void -- including those made made with its public employee unions. If that can happen in Vallejo, why couldn't it happen to Massachusetts and its 351 municipalities -- if that's what it actually comes to, if Widmer's latest predictions finally for once prove to be more accurate than in the past? End of problem: Taxpayer liberation at last! Widmer was finally correct about one thing: "It's no exaggeration to say that your future, and the Commonwealth's future, are at stake." Print Your Own Bumper Sticker! Lexington — Members from the Committee on Small Government and the Massachusetts Taxpayers [sic-Foundation] Association squared off Thursday in Lexington over Ballot Question 1, the repeal of the state’s income tax. The question, which will appear on all state ballots in the Nov. 4 election, seeks to repeal the state’s income tax in two stages. If passed, the new law proposed by the Committee on Small Government will remove $12.5 billion from the state’s coffers and presumably put it back into taxpayers’ pockets. That will force legislators and the governor to either severely cut programs, or find new revenue sources, or most likely, do both. From the outset, Jain and Widmer could not find common ground even in the statistics for state spending. Jain claimed that the state was projected to spend $47 billion this year; Widmer argued it was closer to $32 billion. Jain’s numbers suggested that the $12.5 billion cut would represent roughly 27 percent of the state’s budget. Widmer said the cuts represent closer to 65 percent of the state’s discretionary budget, because nearly $12 billion of the state’s $32 billion is mandatory funding of federal programs like Medicaid. Jain said those consequences would be to reduce the size of state and local government — precisely the reason why the ballot initiative was created. He maintained that the legislature could work out the numbers in order to make government function, despite the cuts. He said the state had spending issues, with towns spending combined $20 billion on top of the state’s spending. When pressed by the audience, Jain could not single out any specific areas that should be cut down, noting that the state’s budget had 5,000 individual line items and was difficult to decipher. Widmer said $12.5 billion in cuts would be very difficult to make. Widmer said that if the income tax were repealed, it would force a hike in the state’s property tax, which would affect low- and middle-income families. When asked by the audience how Widmer would reduce the size of the state’s budget, he said cuts needed to come from state employees’ health benefit and pension packages. Kaufman agreed with Widmer’s assessment and pointed out that any cut in benefits would have to be passed by the employee unions, a difficult proposition at best. Kaufman also said money could be saved by regionalizing services instead of having separate entities in the state’s 351 towns. Members of the audience were concerned that unions’ strength would make pension and benefit cuts impossible. Widmer said that with the current economic climate, smaller government was inevitable anyway. 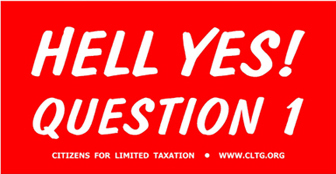 Why are an estimated 1,350,000 Massachusetts voters planning to vote "yes" on Question 1 to end the state income tax? Consider these numbers. If voters end the state income tax, 3.4 million workers would each get back an average of $3,700 annually, and roll back annual state government spending to $34.8 billion. A no vote would require those workers to keep paying an average of $3,700 each year, and maintain state government spending at $47.3 billion. In addition, Massachusetts cities and towns are spending more than $27 billion this year for local services. That totals $74.3 billion in Massachusetts government spending. Subtract $5 billion in state funds given to cities and towns (to avoid double counting) and subtract another $12.5 billion if the state income tax is abolished, and there is still $56.8 billion for city, town, and state governments - more than enough to fund every essential government service. Government waste is one reason so many voters already plan to approve Question 1. Last April, Fabrizio Surveys asked voters: "How many cents out of every dollar you pay in state taxes would you say is wasted by the state government?" Their average response was "41 cents." According to three recent polls, 45 percent of Massachusetts voters plan to vote yes on Question 1, approximately the same number that polls show will vote against the question. With voter turnout estimated to be 3 million, that comes to 1,350,000 votes to end the state income tax. The numbers show we can easily afford to end the income tax, but it's the benefits to the people of Massachusetts that make a yes vote a real winner. In addition to giving each worker an annual average of $3,700, it will take $12.5 billion out of the hands of Beacon Hill politicians - and put it back into the hands of the men and women who earned it. Every year. In productive, private hands this $12.5 billion a year will create hundreds of thousands of jobs in Massachusetts. A yes vote will force the Legislature to streamline and cut the waste out of the budget. It will force the Legislature to get rid of the failed, flawed government programs that don't work - and often make things worse. It will make the Legislature accountable to Massachusetts workers and taxpayers - instead of to government employees, lobbyists, and special interests who profit from high government spending. With less government and no income tax, Massachusetts will become a magnet to private, productive businesses and individuals. This will bring the state more good jobs and more good workers. Massachusetts families will be able to pay off mounting bills and debts. By making the Massachusetts total tax burden more affordable, more young people will be able to stay in Massachusetts near their family, friends, and home. These are the reasons why you should vote "yes" on Question 1 to end the income tax. It's not just what's best for you. It's what's best for 3.4 million Massachusetts workers and taxpayers - and their families. Carla Howell is chairwoman of the Committee For Small Government, sponsor of ballot Question 1. "It's time to send them a message. They just don't get it." As I travel across the state speaking in opposition to Question 1, the refrain is the same. There is a palpable sense of frustration with political leaders, and unfortunately Question 1 - the proposed income tax repeal on the November ballot - has become the misguided means for expressing that frustration. And given the economic squeeze facing individuals and families - increasing costs of food, energy, and other essentials, declining property values and retirement investments, and concerns that their jobs may be eliminated - it is not surprising that they would be tempted to vote themselves a tax cut. Though it is the wealthy who would get a tax cut and the lower-income people who would likely end up paying more. Massachusetts is already facing enormous fiscal and economic problems that would increase manyfold if the income tax were repealed. There is at least a $1.5 billion shortfall in the fiscal 2009 state budget, and with a likely sharp decline in capital gains taxes the deficit could be larger. Cities and towns are reeling from a combination of higher property taxes and cuts in services. Roads, bridges, and transit systems are deteriorating at an alarming rate. The income tax produces $12.5 billion, or 40 percent, of the approximately $30 billion state budget. What would be the result if it were eliminated? To put it in perspective, if you were to lay off all 67,000 state employees - e.g. correctional officers, highway engineers, college professors, judges, mental health counselors - you would save only $5 billion. Absurd, of course - which is the point. The loss of the state's principal revenue source would create fiscal, political, and legal chaos. The state's bond rating would plummet, and what business that depends on predictability would make an investment under such circumstances? The ultimate irony is that the inevitably huge cuts in state aid to cities and towns would lead to large increases in property taxes. So the lower- and middle-income families who thought they were voting themselves a tax cut would likely end up paying more in taxes, just out of a different pocket. Meanwhile, the wealthier who pay a higher share of income taxes would get a big tax break. So how do the nine states without a personal income tax survive? Several have a strategic asset, such as oil in Alaska, minerals in Wyoming, gaming resorts in Nevada, or tourism in Florida, that raises large amounts of money. Five of the states rely heavily on state and local sales taxes - Florida, Nevada, South Dakota, Tennessee, and Washington rank among the top 11 states in terms of their sales-tax burden. New Hampshire ranks third in the nation in the burden of state and local property taxes. Yes, government needs to be reformed, but in the end there is a close connection between the level of taxation and the services the citizens receive. There, the city of Vallejo is fighting to tear up its labor contracts with police and firefighters through bankruptcy court. A ruling allowing the pacts to be dissolved may give other towns precedent to run to court and overturn collective bargaining agreements they can no longer afford. "It's a landmark situation for the municipal credit market because the city has some of the same characteristics that are so common to many other cities across the country," said Richard Ciccarone, a managing director and chief research officer for Oak Brook, Illinois-based McDonnell Investment Management. The firm oversees about $5.4 billion of municipal bonds. A Vallejo win might benefit bondholders by putting the city in a better fiscal position to pay investors holding its $200 million of debt, said Matt Fabian, managing director at Concord, Massachusetts-based research firm Municipal Market Advisors. "So long as bondholders are paid, that will add comfort to the market," Fabian said. "They are first in line. The city realizes they need access to the capital markets." "A lot of eyes are on us now," said Vallejo councilwoman Stephanie Gomes. "We may be ahead of the pack but there's definitely a pack behind us that has gotten themselves into unsustainable labor contracts and expenditures." The town of 117,000 on the northern edge of San Francisco Bay may win. Bankruptcy Judge Michael McManus rejected a plea on Sept. 5 by labor unions to dismiss the case, saying it's broke and deserves protection from creditors. Last week, he gave Vallejo and its unions until December to work out a deal before he rules on whether to void the labor agreements. "The legacy costs of more prosperous days are coming home to roost," Ciccarone said. "Like the auto and steel industries, the boom times are over and you have a harder time paying those costs." Cities and towns rarely go bankrupt. Since 1937 there have been 543 municipal filings, two-thirds of which were small tax districts established to sell bonds for projects, according to James Spiotto, an attorney and municipal bankruptcy specialist at Chapman and Cutler LLP in Chicago. The remainder was mainly caused by unique circumstances. Orange County, California, was felled in 1991 by bad bets with leveraged investments. Desert Hot Springs, a California town of 20,000 near Palm Springs, filed for bankruptcy protection in 2001 after it was hit by a legal verdict it couldn't afford. The stigma of heading to debtors' court may prevent a municipality from borrowing money for years to come and erode confidence among investors, Spiotto said. Municipal bonds are down an average of 0.01 percent this year, according to Merrill Lynch & Co. index data. "Chapter 9 is the third rail of municipal finance," said Spiotto, referring to the part of the bankruptcy code dealing with municipalities. A filing that allowed Vallejo to rewrite its labor agreements and cut costs might weaken the bargaining power of workers' elsewhere by showing the bankruptcy option has "teeth," said Fabian at Municipal Market Advisors. Vallejo in May sought bankruptcy protection after incurring a $17 million budget deficit. City officials blame the shortfall on labor agreements that date back more than 15 years, when the current employee contracts were first signed. Police and firefighting salaries, pensions and overtime consume more than 70 percent of Vallejo's $89 million general fund budget, higher than the 60 percent average throughout the state, according to the League of California Cities. Those expenses have been harder to meet as a housing slump crimped tax receipts. Sales-tax revenue dropped 7 percent in the fiscal year ended in June. "For cities that are facing binding arbitration requirements and their public safety costs are higher than they feel they can afford, the Vallejo situation might signal a new strategy cities might use to push for a renegotiation of those contracts," said Chris Hoene, the league's director of policy and research. Clovis, California, a farming community of 93,000 people in the state's rural central valley, avoided the bankruptcy option. The city this month reached an agreement with its public safety labor unions that includes almost $750,000 in pay and benefit cuts for police and firefighters as a way to help that city fill a $4 million budget gap. City workers were asked to give up $1.4 million in salaries and benefits. "What's going in Vallejo is like the nuclear option in negotiating with city employees, and it is destructive to your community, its citizens and the city's employees," said Clovis Mayor Bob Whalen. "It's a button you would never want to push, and it's a button you don't have to push if you have open and fair dialogue with your employees." Vallejo is a danger because it will give politicians an excuse to blame their own mistakes on public employees, said Jeff Zach, spokesman for the International Association of Fire Fighters. The Washington-based union represents 288,000 fire fighters and paramedics in the U.S. Giving a judge the power to re-write a contract is a "huge concern" and may put public safety at risk, Zach said. Vallejo's firefighters say their pay is the result of forced overtime because there aren't enough of them on the job. "What does a bankruptcy judge know about how many fire fighters you need to arrive on a scene and how much time it takes to attack a fire and execute a rescue?" Zach said. The Vallejo case is In re City of Vallejo, U.S. Bankruptcy Court, Eastern District of California (Sacramento).